Host Helga Davis stops by to talk about her chats with cultural luminaries and her "unconventional life in performance." Ariel Burger on "Witness: Lessons from Elie Wiesel’s Classroom." Meg Wolitzer on "The Female Persuasion." Helga Davis on the Helga podcast. Kimberly Drew, known online as @museummammy, is a unrelenting purveyor of art, fashion and culture. She joins Helga to talk mental health and how drinking water helps her keep the beat. Teacher, author and speaker, David Kyuman Kim joins host Helga Davis to discuss "radical love" and the essential role of community in shaping how we perceive the world around us. National Book Award winner Jacqueline Woodson sits down with host Helga Davis to talk about the power of family – the so-called alternative ones she was born into and made for herself. Award-winning director, screenwriter and playwright Kenneth Lonergan talks with host Helga Davis about their charged, formative years in high school and how he fuels his creativity. 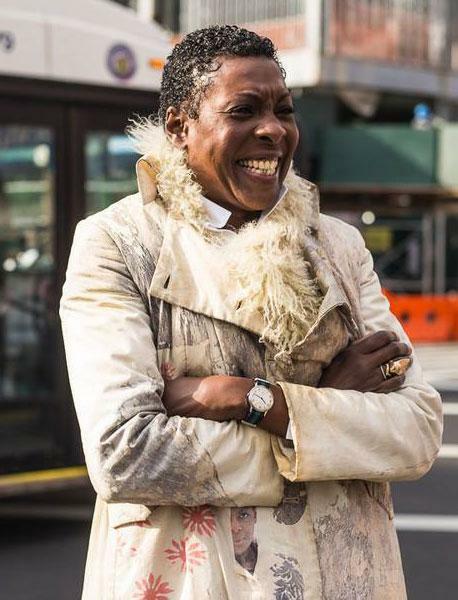 Thelma Golden, director and chief curator at the Studio Museum in Harlem, joins host Helga Davis for a conversation about her upbringing, daily rituals, and seeing the world through art. The second season of our conversation podcast, Helga, with host Helga Davis is just around the corner. New episodes begin Monday, March 26 with eminent art curator Thelma Golden. Ascendant singer and band-leader Bryndon Cook of Starchild & The New Romantic talks with host Helga Davis about his upbringing and his jazz, pop, and funk-inflected debut album. Our Electric Nights series return to Public Arts tonight, Thurs., March 29, with Berlin-based producer Laurel Halo and percussionist Eli Keszler. Singer-producer Embaci opens. On Friday, March 9, songwriter/multi-instrumentalist Bryndon Cook lead his band Starchild & The New Romantic in performing his funk and electro-spanning debut album in The Greene Space. The composers join Apollo Theater executive producer Kamilah Forbes and vocalist Helga Davis for a conversation about the contributions of black artists to contemporary opera. Singer-songwriter Toshi Reagon's "Brooklyn Bound" offers a honest and poetic musical look at gentrification in Crown Heights. Watch the second of our "Silent Voices" documentaries. The Brooklyn Youth Chorus recently created space for conversation about social justice through commissioning ten new works. We dive into one: Kamala Sankaram's "Keeping the Look Loose." Watch a performance by Vijay Iyer and friends from The Greene Space at WQXR as the genre-bending pianist-composer shared the stage with a diverse array of musical collaborators. Watch the release party for Brooklyn Youth Chorus' 'Black Mountain Songs,' featuring Arcade Fire's Richard Reed Parry. In January, the Brooklyn Youth Chorus offered an early listen to their "Silent Voices" project, which gives voice to those who have been silenced by social and political circumstances. Tuesday, March 7 at 7:30 pm, watch a live video-stream of the trailblazing Kronos Quartet and Face the Music, Kaufman Music Center's acclaimed youth ensemble, live from The Greene Space. In Sarah Jones's one-woman shows, she seamlessly slips into characters of different classes, races and genders. Jones and Davis talk self-love in a culture that teaches self-alienation.